The Economic and Financial Crimes Commission (EFCC) has dismissed an allegation by Nigeria’s Deputy Senate President, Ike Ekweremadu, that it is plotting to set him up by planting monies and guns in his residence. Mr. Ekweremadu made the remarks earlier in the day at the National Assembly, the EFCC said, claiming he was tipped off about the purported plot by an “EFCC covert investigative journalist” who was privy to the design, supposedly to be implemented on May 6. 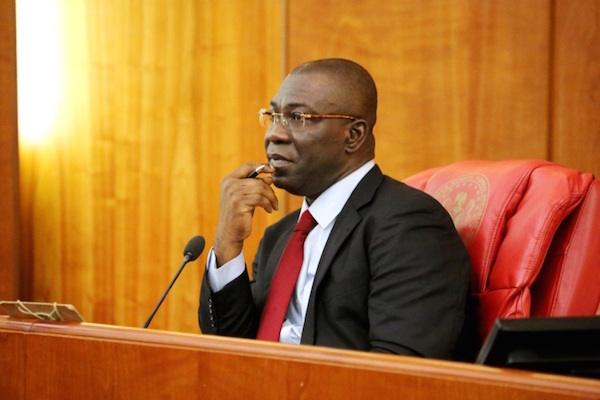 The attention of the Economic and Financial Crimes Commission has been drawn to the alarm purportedly raised by the Deputy Senate President, Ike Ekweremadu at Wednesday May 3 plenary of the upper chamber of the National Assembly. The distinguished Senator alleged that there were plots by the Commission to set him up by planting monies and guns in his residence. Ekweremadu who claimed that he was tipped off about the purported plot by an “EFCC covert investigative journalist” privy to the design, told his colleagues that the agency had secured a warrant and plans to stormed his home on May 6, 2017, under the guise that it was working on information provided by a whistle blower regarding “huge amount of money of (sic) currency in the apartment said to be belonging to you Ike Ekweremadu.” He said going by the script of plot he is to be arrested, detained for three weeks and charged to court while his constituents would be mobilized to protest and seek his recall from the National Assembly! The Commission wishes to state in very strong terms that it is not aware of any plot to set up Ekweremadu for any arrest. If any agency is plotting to plant monies and guns in Ekweremadu’s residence, it is certainly not the EFCC as such antics are alien to the Commission. Nevertheless, the Commission is worried by the alarm and the fact that the highly-regarded Deputy President of the Nigerian senate would go public with such unverified information without first double-checking with the Commission. This is not only very strange but smacks of a scripted propaganda campaign to distract the Commission by putting it on the defensive. It must be emphatically stated for the benefit of Senator Ekweremadu and others who share similar misconception and jaundiced views of the EFCC, that the Commission does not need any grand plot to arrest and prosecute him if he is found to have violated any law that EFCC enforces. He does not belong in the category of public officers that enjoy immunity from arrest and prosecution by law enforcement agencies. Once again, the alleged plot by EFCC to raid Senator Ekweremadu’s house on May 6 2017, exists only in the very fertile imagination of the Distinguished Deputy Senate President’s questionable “source”, whom he claims is “Close to the EFCC”. The Commission’s candid advice to Ekweremadu is to sleep easy if he is not involved in the looting spree that seems to be the pastime of many Nigerians in the corridors of power. Let it be known however, that there will be no amount of scare-mongering that will dissuade the EFCC from vigorously enforcing its mandate to rid Nigeria of corruption.